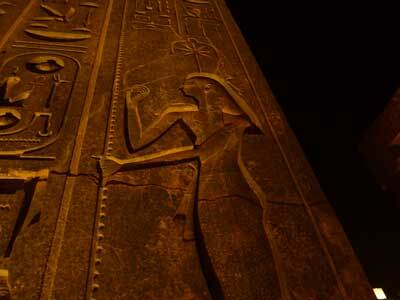 Isis was the first daughter of Geb, the earth god and Nut the sky goddess, and she was the sister and wife of Osiris. 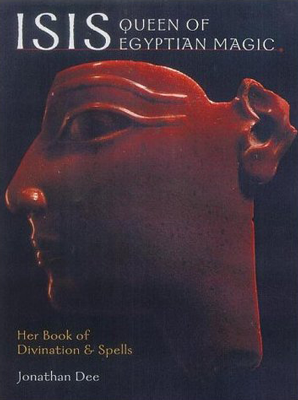 Her Egyptian name was Auset, thought to mean “throne”. In the murals Isis is often portrayed wearing a vulture-shaped headdress with two horns cradling a solar disk, revealing her association with Ma’at and Hathor. Isis and Osiris were thought to be the first rulers of Egypt and they governed their people with kindness and compassion, bringing civilisation to a primitive land. Isis taught the women husbandry, weaving, sewing, pottery, medicine and language—all the vital skills to create an advanced society. Isis was worshiped throughout ancient Egypt and the Graeco-Roman world, and well into the Christian era—ancient shrines were found throughout Europe and the Middle East, even in London and Paris. Her cult centre was located at the Temple of Philae, a most mystical place where the sacred Isian rites were performed by her disciples, until the pagan temples were outlawed in the 6th century by the Emperor Justinian. Today it is an inspiring place to visit as the temple has many intimate chambers and carvings, giving the visitor the perfect place to meditate. Philae was the last surviving temple in the Christian world, as the followers of Isis refused to leave their beloved sanctuary. Isis’ influence can be seen in the worship of the Black Madonna and the Virgin Mary. Like Isis, Mary protected and nurtured her son, so he could bring peace and humanity to the world. Through the Fellowship of Isis and many other factions, the worship of Isis is gaining momentum in the present millennium, as people are drawn to the old magic and healing powers of the goddess. Circle of Isis by Ellen Cannon Reed. The author has been a member of a coven for 25 years and her knowledge of witchdraft and Egyptian magic is both professional and personal. As a Wiccan High Priestess you get an insider's view into pagan worship, with deep insights into the Egyptian deities, rituals and symbols. 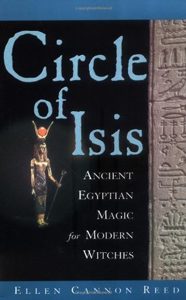 Isis, Queen of Egyptian Magic: Her Book of Divination and Spellsby Jonathan Dee. A beautifully illustrated book with over 60 colour artworks and photographs. Written in the first person, as if Isis is speaking to the reader. The book includes stories, myths and spells on many subjects including love and good fortune. Isis describes the appropriate amulet required to ward off evil and offer protection- from scarabs, scorpions to the Eye of Horus. And there are potent recipes for health, fertility and increasing spiritual powers. Osiris is the god of resurrection, fertility and vegetation; he is also ruler of the Underworld. His annual rebirth is associated with the fecundity of Egypt; the Nile flood and the fertile crops that offered new life in this otherwise desert land. 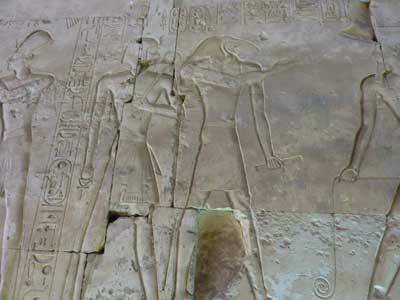 Osiris is the God of Green Life, the original Green Man, his image is often painted in green malachite. His death is associated with the reaping of the corn at harvest time and the severed shafts of wheat lying in the fields. The sense of death is heightened by the shrinking of the Nile and the parched land, which could easily lead to famine and chaos, if not for the return of the floodwaters and the renewal of life. Much like the cycle of nature, through his death and rebirth, Osiris taught his people about Paradise and gave them the notion of eternal life. Osiris’ Egyptian name was Ausar, meaning strength or power (the hieroglyph is interpreted as meaning “Strength of the Eye”). Osiris was the first son of Geb and Nut, and his siblings, Seth, Isis and Nephthys were seen as the first children of Egypt. Osiris married Isis and together they brought stability and culture to the world. When Osiris became king it was believed the people were barbarians, who practised cannibalism and had no knowledge of art or writing. This story suggests Osiris ruled in pre-historic times, long before the advent of farming and communal living. As a divine-king Osiris introduced agriculture, and taught people how to build towns and temples in order to pray to the gods. Osiris and Isis asked many divine beings to help them develop civilisation on earth. Ma’at created justice and the order of the cosmos, Hathor brought music and beauty, and Thoth and Seshet taught people writing and esoteric knowledge. Osiris was worshipped throughout Egypt, but his most important cult centre was Abydos. Believed to be the burial site of Osiris, Abydos became the sacred city of the dead, and pilgrims came to honour their god and take part in the Mystery Plays, a festival re-enacting his life, death and resurrection. Everyone wished to be buried in this mythical place, the gateway to Eternity. Today the desert is covered in ancient cemeteries stretching back several millennia, an archaeologist’s dream. Horus was the son of Isis and Osiris, who became the mighty ruler of Egypt after his father’s brutal murder. 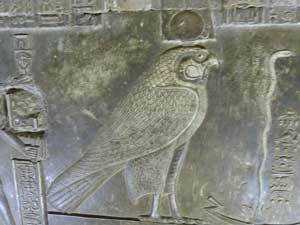 His ancient name is Heru, meaning “falcon”. He was worshipped as a sky-god and protector of warriors, and people called upon him in times of trouble, to offer them strength and resilience. The Eye of Horus became a symbol of protection and the local people often wore the amulet to shelter them from harm. Horus was born in secret and his mother hid him in the reeds, as his uncle Seth wished to murder him, fearing Horus would one day challenge him and become Pharaoh. Nurtured by his mother, aunt Nephthys and mentor Thoth, Horus emerged from the reeds triumphant and lost no time toppling Seth and becoming Pharaoh. King Horus ruled Egypt like his father Osiris, returning stability and peace to the land. The similarities between Horus and Jesus are quite remarkable: both were conceived by divine means and were hidden in the reeds; both were thought to be the saviour of mankind. Every living Pharaoh was seen to be a Horus on earth (and to be an Osiris in the Afterlife) and even today the falcon symbol is associated with heraldry and power. 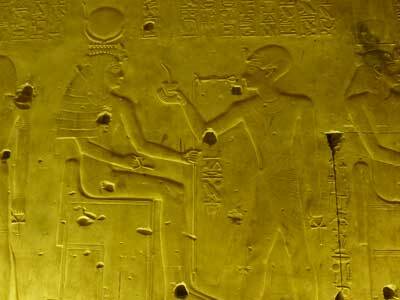 Horus’ cult centre is located at Edfu. 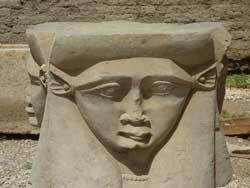 Hathor is said to be the wife of Horus, and her name means “House of Horus,” revealing her royal heritage. Hathor is an ancient goddess, thought to be related to one of the earliest fertility figures, when people were thought to revere cows for their life-giving attributes, much like in India. 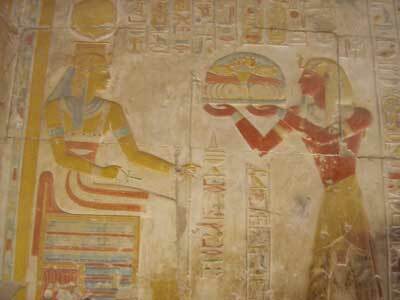 In Dynastic times Hathor was usually associated with motherhood, love and fertility. But she is also associated with music, joy and drunkenness. 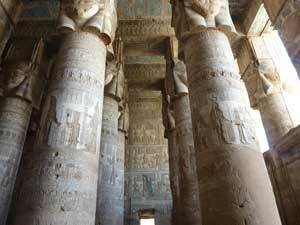 Hathor is often depicted on pillars with cow ears and great bovine eyes, expressing her love of life. On murals she wears a headdress with large horns surrounding a solar disk and a mighty uraeus. 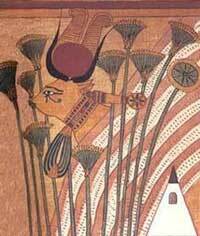 Hathor is also known as Lady of the Sycamore and in the Papyrus of Ani she is shown as a cow wading in the reeds, with her all-seeing eyes, a most beautiful portrait. 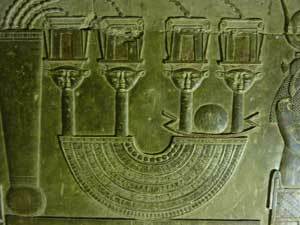 Hathor’s cult centre was located at Dendera, where the priestesses expressed her sense of joy, artistry and beauty. The priestesses of Hathor were esteemed throughout the land, famous for their graceful dancing and musical talents. Revered as the goddess of writing, wisdom, keeper of records and sacred measurements. 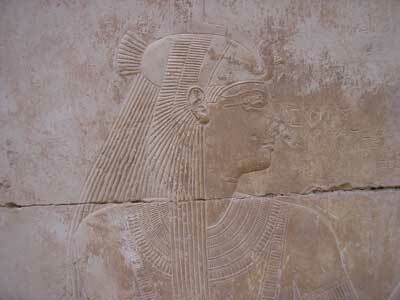 Her name means “She who is the Scribe,” Seshet is also associated with architecture, building, mathematics and accounting. She is depicted with a seven-pointed motif on her crown, like the hemp leaf. This is because the hemp rope was used to measure the sacred alignments for temple building, which is her domain. The leaf also represents the papyrus plant, which the scribes used to write on. Seshet often holds a palm stem and etches notches upon it, recording the passage of time. Her leopard skin robe symbolises the night sky and her vast knowledge of the stars. Seshet’s secret knowledge was taught to her priestesses who performed the sacred rope measuring ceremonies. The knotted rope was used to measure the foundations of new pyramids and temples, to ensure the planetary and cosmic alignments were attained. Seshet’s sacred knowledge was only revealed to her adept pupils, who spent many years studying astronomy and mathematics. The precise measurements were a vital part of their religious beliefs and ensured that life on earth mirrored the cosmic design above. Known as the god of writing, esoteric wisdom and the moon. 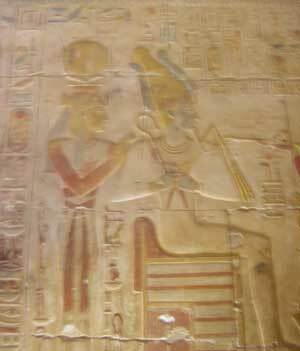 His ancient name was Tehuti, Lord of Khemennu. Called Thoth, Three Times Great, he was later associated with Hermes Trismegistus, the Greek god of wisdom and astronomy. Some believe Hermes was the reincarnation of Thoth, who was responsible for bringing the old knowledge into the next age. Thoth is depicted with the head of an ibis, the bird associated with writing as his beak resembles a scribe’s pen. The ibis dips his beak into the Nile, like the scribe dipping his pen into the ink. 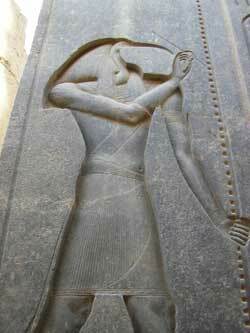 Thoth is also portrayed as a baboon, a nocturnal creature linked to the moon. Thoth is known as the “Reckoner of Time” calculating the planets, stars and galaxies. The 42 Books of Thoth are thought to be the oldest books on esoteric wisdom. It was believed Thoth and Seshet gave the Egyptians their knowledge on architecture and geometry, which enabled them to build the pyramids and temples. Although the 42 Books of Thoth have been lost, the ideas have continued in the Hermetic writings. Scholars studying the Pyramid Texts have discovered identical ideas to those found in the Hermetica, written over 5000 years ago, and some suggest the wisdom is even older. Thoth’s wisdom continued through Hermes’ teachings and thanks to Plato and Pythagoras these ideas spread throughout the Greek world and into Europe. By way of this amazing journey, Thoth’s knowledge has had a great influence on the Western imagination and profoundly shaped human consciousness. However, the Roman church viewed the teachings as heretical and they were suppressed for many centuries. The Arab scholars were also fascinated with Thoth-Hermes and they are credited with bringing Hermeticism into Moorish Spain, where it once again spread through Europe. The re-emergence of the Hermetica in the 15th century coincided with the Renaissance, as Leonardo da Vinci, Michelangelo, Botticelli and Copernicus all studied the esoteric texts. In fact most of the great thinkers, writers and scientists throughout history admitted to reading hermeticism and being inspired by Thoth’s ancient knowledge. In Britain the influence was massive: Roger Bacon, Thomas Moore, Milton, Shakespeare, Isaac Newton, William Blake and the Romantic poets—the list goes on. 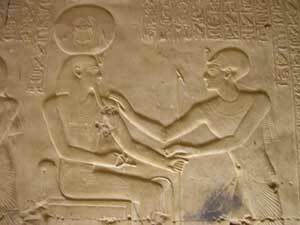 What is so fascinating about Thoth and Hermes’ wisdom? To Copernicus it was the notion that “The Sun is the Visible God,” and that the sun is the centre of the universe, not the earth. This Hermetic idea led to Copernicus’ great discoveries in astronomy. The greatness of the Hermetica is the belief in Oneness, or the Cosmic Mind; that we must free ourselves from physical restrictions and look beyond. We must delve into invisible things and there we will find the secrets of the universe, wisdom and truth. Thoth’s teachings urge us to free our minds from restrictions, from mediocre ways of thinking, to think like a god, an omniscient being. If anyone wishes to read a modern edition of the ancient wisdom, we recommend The Hermetica. Timothy Freke & Peter Candy. This book outlines the main teachings of Thoth-Hermes, written in a lively and readable way. A fascinating account of the ancient wisdom and how it continues to influence thinkers up to the present day—from Copernicus to Stephen Hawking. This book is a collection of the ancient wisdom, religious and funerary texts from ancient Egypt, containing fascinating material from the Book of the Dead. This is a classic on hermetic philosophy, outlining the main principles; revealing how the spiritual notions in hermeticism can be related to the laws of quantum physics—that the universe is like a great mind, with an intrinsic intelligence.